It looks like Samsung is building a rugged Galaxy S7 Active for AT&T, continuing the partnership which began with the Galaxy S4 Active back in 2013. 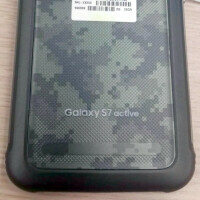 Photos of the device leaked all the way from Vietnam, showing a camouflage back panel with rubber bumper protection for the top, bottom, and sides. We assume they are legit, consider Samsung has significant manufacturing operations in the country. While more compact than its predecessor, the Galaxy S7 Active seems a fair bit bulkier than the regular model, and for good reason. It seems the entire metal frame has been replaced with a mixture of polycarbonate and rubber for better impact resistance. As usual, the capacitive touch keys have been replaced with tougher physical buttons. The S7's metal frame has been replaced with poly-carbonate and rubber, military-style! Reportedly, the phone corresponds to military standards for drop damage and features IP68-certified water and dust resistance. With these structural changes, the S7 Active is definitely shaping up to be a trooper, and to make things even better, the handset is powered by the Qualcomm Snapdragon 820 chip, complete with 4GB of LPDDR4 RAM. While not as tough as a Caterpilar phone, the S7 Active will be the most powerful rugged phone around when it ships in the coming weeks. With the handset already out in the wild, we suppose it won't take long before AT&T and Samsung announce it in the United States. Looking at the price difference between the Galaxy S6 and S6 Active, which is just $10, we assume the rugged model won't be much more expensive that the Galaxy S7. The leaked Galaxy S7 Active photos are available below. Cheers! Sprint had the S6 active and the S5 active. I think they were called something else. S4 Active was exclusive at first but was released worldwide later. Had the S6 active for about 6 months. The battery life was best I've ever had. I wish that this phone wasn't an AT&T exclusive. I didn't realize this device sold well enough to warrant a 4th generation device. I've never seen one in real life. I see S6/S7 devices everywhere. S6 Active owner here... best battery life, usefulness and durability I've ever owned in a smartphone. It will be interesting to see if they can incorporate the finger print scanner in this version. I'm interested about the Software situation. Did you get Marshmallow? Otherwise its an awesome phone!